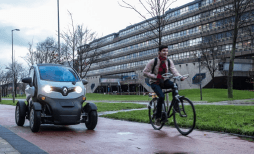 Researchers and businesses alike can conduct tests and experiments with automated vehicles at the TU Delft campus. This can be done using their own vehicles or vehicles from the lab. Below, you can read which vehicles from the lab are available for tests. 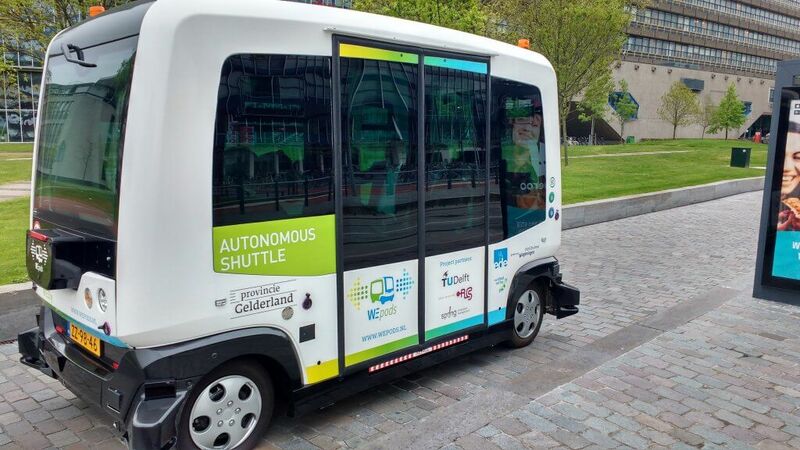 The WEpod is an electric shuttle for 6 people and a steward, that can be driven as fully automated, semi-automated, or manually, with a maximum speed of 25 km/h. In semi-automated mode, the vehicle drives itself and the speed is adjusted using a joystick. In manual mode, the steering and speed are controlled with a joystick. The steward on board is tasked with monitoring safety. The WEpod is will be deployed in Ede-Wageningen and Weeze from 1 January 2019 onwards. Status: The WEpod is available part time, in Ede-Wageningen. The Prius is a hybrid passenger car (Toyota Prius) that can be driven manually, either normally or with a joystick, or in a partially automated mode. The Prius is designed for semi-automated testing on the open road, during which the driver can assume direct control over the vehicle (steering/braking) or the vehicle is remotely controlled from the passenger seat using the joystick. Status: The Prius is equipped with video cameras in preparation for automated driving, and video cameras inside to observe driver behaviour. 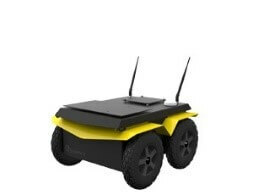 The vehicle can be driven with a joystick, can drive in a platoon, and can accurately determine its position using DGPS-RTK technology. The Twizy is an electric, dual-mode vehicle for 1 person. It can be driven manually (steering/pedals) on standard roads at up to 85 km/h. In drive-by-wire/wireless remote control mode, it drives at a maximum of 25 km/h along bicycle paths. The end goal of the development is that the Twizy can be manually driven on standard roads (incl. Kruithuisweg) to the station at common speeds and that the vehicle will drive unmanned along the bicycle path (at approx. 20 km/h). Status: The Twizy has been a drive-by-wire/wireless remote control functionality. This is a small platform for automated driving (L=50cm, B=43cm, H=25cm), without structures or provisions for passenger transport. It has a max. speed of 7 km/h. The Jackal is intended for simple testing by students for the purposes of mounting special instruments or outfitting the vehicle with a structure/equipment, e.g. a doll that functions as a pedestrian during a test. The Jackal will drive on the Esplanade or in The Green Village, or participate as an “artefact” in the simulation/testing of traffic scenarios elsewhere at RADD. Status: The Jackal can be driven by remote control.